Brewers can use the Steam Infusion Vaction™ Pump for fast, energy efficient and clean wort heating. The unique processing environment delivers proven energy saving, is inherently maintainable as there are no moving parts and offer brewers compelling alternatives to traditional brewhouse processing equipment. University of Lincoln research and brewing reference sites demonstrate the technology’s unique ability to transfer energy more efficiently than traditional processes. Shepherd Neame, Britain’s oldest brewer, has reduced energy consumption by 40% by switching from an external wort boiler (EWB) to a Steam Infusion Vaction™ Pump system. For their 300hl copper, the Steam Infusion wort heater with a four Vaction pump array reduced the boil time from 60 to 30 minutes. a week (along with other brewhouse equipment) and as Shepherd Neame was limited by copper volume, not fermentation volume, they were able to run an extra brew, per copper, per week. The quality of their beer between brews also increased because there was now no accumulation of burnt material on surfaces. What is a Steam Infusion wort heater? The Steam Infusion Wort Heater fits onto a recirculation route from the copper and comprises of a Vaction™ Pump, the number of which will vary dependent on throughput. The Vaction™ Pump is a fluid processing system designed to provide mixing, pumping, heating and agitation of a slurry/fluid through rapid expansion and condensation of steam passing through the device. The simple design makes it easy to incorporate into a new set-up or fit it into an existing brewhouse replacing a traditional wort boiler or adding it to the copper using an external recirculation loop. The system can then be adapted for different copper sizes by varying the number of Vaction™ Pumps together with the size of the expansion column. It is the expansion column on the outlet of the Steam Infusion array that allows for extended two-phase flow; a key requirement for efficient volatile stripping. The heater is placed close to the copper and the wort re-circulated through the array returning back into the copper piping via a spreader plate. The Steam Infusion Wort Heater is fitted on a recirculation loop from the copper. The Wort Heater comprises of a number of patented Vaction™ Pumps. The OAL Wort Heater system is specifically designed and fitted to maximise brew-house production requirements. Whether as a direct replacement for a traditional external wort boiler or an alternative for an internal wort boiler the OAL Wort Heater can be incorporated as part of a new brewery design or retrofitted with minimal disruption to production. The system is fully controllable with a PLC system and can be integrated into current plant operating systems. The Wort Heater system uses patented technology allowing wort to be heated efficiently and uniformly. The system consists of an array of Vaction™ Pumps designed to heat the wort. 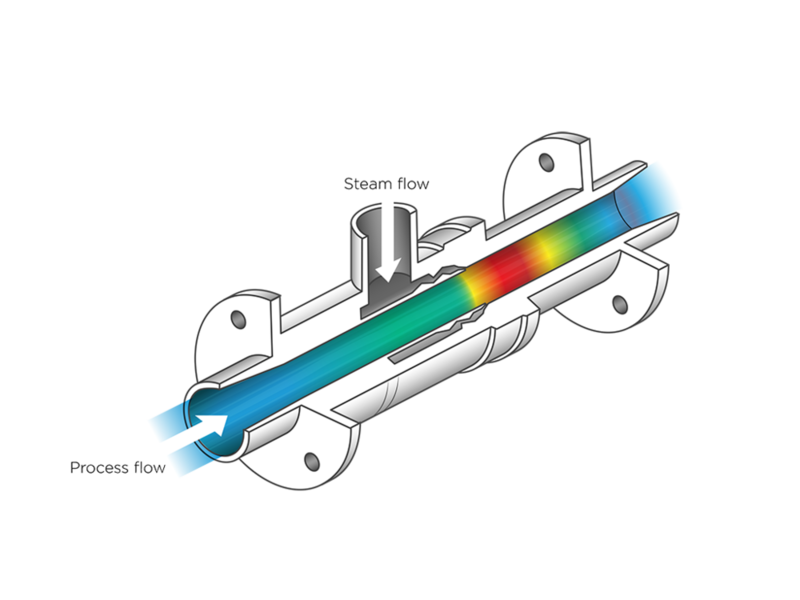 Steam flows within the Vaction™ Pump from an external supply into an annular conditioning chamber from where it is injected directly into the process flow. This unique design results in a disruptive steam flow which breaks up the process flow and allows fast, effective heat transfer.